So far, we have heard about Ribbon interface in Microsoft office suite 2007. Indeed, Microsoft started its journey and now has reached up to Windows 8 Ribbon Interface, which is much more exciting and easy-to-use. Many of you must not have seen the ribbon explorer. So lets check out, how to activate and use new Windows 8 Ribbon Explorer on your PC. Either you have to expand the Ribbon interface in Windows 8 or just press CTRL+F1 to launch the Ribbon Explorer in Windows 8. However, to expand the Ribbon Explore,r just expand the down arrow key as shown in the picture below. The three core of Windows 8 Ribbon Explorer is “Home, Share and View“ and the most important “File Menu”. The Home tab contains major options like copy, paste, cut, delete, move to, copy to, select all, history, properties, copy path and much more. 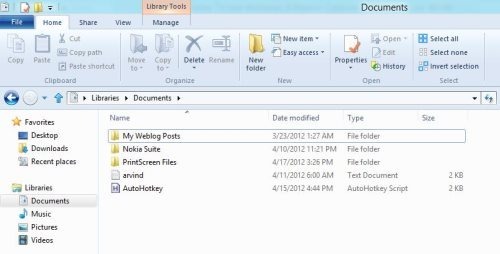 The Share tab contains options like Zip, Email, print , fax, Burn to disc, and advanced security option. View tab comes yp with options like navigation pane, detail and publish pane, sort by, group by and also contains options like hide selected items. Note: Some of the main tabs may change as you select upon different items. As you select the system navigation pane, the home tab changes to computer tab and the share tab disappears. 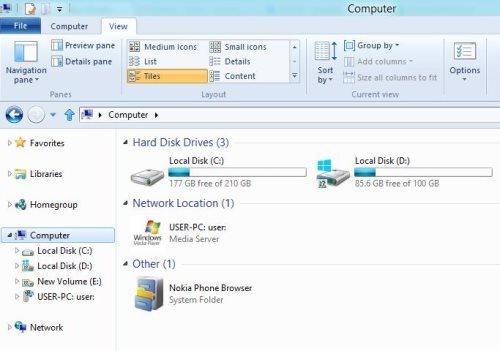 The computer tab is easy to access and allows you uninstall programs, check out system properties and much more. Disk tool is also a conceptual option which allows you format, optimize, clean up and bit locker, which mainly works on hard drive and removable medias. Select any of the appropriate leads you to access the disk images tools. You can view the description with short keys on moving mouse over any option. It will display a pop up which shows a brief description and allows to access option via key board. Most of us have good presentation accessing through keyboard. You can easily check out the hotkeys by pressing ALT and desired key option to access the ribbon interface. 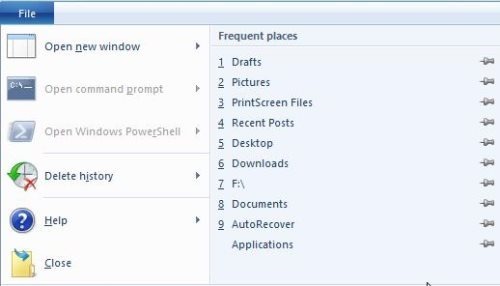 Now moving onto file menu, This option allows you access new explorer on windows and also allows to access most recent view tabs. The file menu provides an easy access to both Windows PowerShell and Command prompt. You can even access them by logging in as Normal or Admin users. You can even delete the history with a single click on accessing the file menu. View menu enables you to customize the panes, shows the hidden items and hide file name extension. It also allows to set “change folder and search option”. 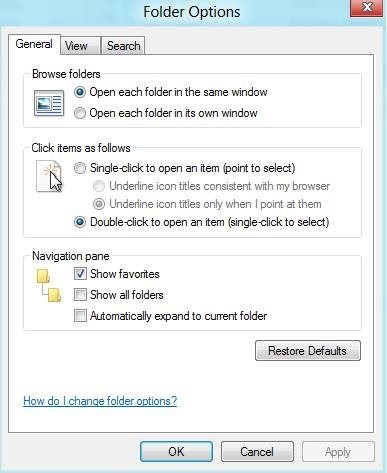 Selecting the “change folder and search option” allows you to explore the folder option as similar you accessed in previous Windows Edition. Enables you to easily change of the layout of files and folder option. It also allows you to set different sized icons. In the right corner, you can view of the two customizable pane, which allows to switch between detail view and large icon view. The same “quick access toolbar” retained from Microsoft Office to all new Windows 8. You can simply right-click “Add to quick access toolbar” to any option on Ribbon explorer. By default, you can view off the folder option and properties available on “Quick Access Toolbar”. You can also add option to this “Quick Access Toolbar”. You can easily mount up to any previous windows by pressing ALT + UP arrow key. Also, check out our post on Windows 8 Restart Explorer Process. You may take some time to get used to it, but you can easily most of the files and perform different actions through this Ribbon explorer in Windows 8. Ribbon interface in Windows makes easy and convenient management all files and folder on your Windows 8 PC.